Today’s post is under the theme occasions and we begin by celebrating Guru Nanak Jayanti. In our families whenever we begin some new venture, Kadah Prasad is a must. So beginning our month long marathon here is a langar with Kadah Prasad. 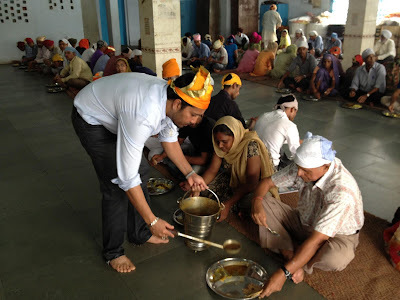 Langar is the food that is served in Gurudwaras. This is free food service, where the food is simple and is prepared and served by volunteers called sevadars. Their menus are normally fixed and in most Gurudwaras we find them serving whole gram, the black or kaali daal as popularly known . They serve a dry vegetable, some salad or curd. The chapatis are normally quite large. Any function that is held in Gurudwaras be it a wedding or paath , Kadah Prasad is a must .It is normally prepared by the ragis or sevadars. Kadah Prasad is a sweet, which is flour based, you can call it halwa too.This is regarded food blessed by the Guru. All devotees who visit the Gurudwaras receive this Prasad .It holds a lot of importance in Sikh religion.The religion gives prescribed method of preparing, distribution and the way of receiving the Kadah Prasad. The Prasad has to be prepared after bathing, one has to be bare footed and cover the head .while the Prasad is being made holy scriptures ( Wahe Guru ) is recited.The Prasad has to be accepted with cupped hand…no paper cups or napkins. Recently when we had a paath for my dad the ragis made this Kadah Prasad.I was very keen to learn the right method.I stood next to the sewadaar while he prepared the prasad, stirred it a couple of times and chanted the hymns. The recipe has lots of ghee, but this is how it is, and I have not changed it . This Prasad does not have any kinds of nuts or flavoring. The logic behind it is that it has to be soft so a lick from it can be given to a little baby..and at the same time an old man who does not have any teeth can also eat it. Roast till pinkish golden and till you get that wonderful aroma. Add sugar and give a few vigorous stirs. Transfer to a clean bowl, cover with a lid and a fresh napkin. Boil the cauliflower and potatoes separately , till 90 percent cooked. Add cumin seeds, green chilly and ginger. Add the spices and then cauliflower and potatoes. Simmer for a few minutes till the veggies are done. Wow Vaishali, this is such a beautiful post..I love how you add on those extra pictures that gives such wonderful insight into the whole post..Kadah Prasad is almost like how the wheat sheera is made right, how long should one keep cooking after the sugar is added?..the texture looks so good.. Thanks Valli ! One needs to give a few vigorous stirs, so that the sugar melts..no more cooking is required. wow.. wonderful presentation with nice post… i just lov the flavor of the Prasad & food at langar..
nice themes for Blogging Marathon.. wish to join..
Vaishali, such a beautiful post! What you have written comes right from the heart 🙂 You have explained everything properly. It makes it easy for people like me to follow, for whom this is all new!! Kadha prasad sounds fabulous, obviously i never had a chance to taste this.. Both dishes looks delicious..
Vaishali as a child I would often go to Langars with my Punjabi friends.I just loved the food.The Prashad is to die for.I will definitely go for a Langar if I can now.Thanks for the Prashad recipe.I am going to make it right away.please also post more authentic Punjbai recipes ,the ones which are made at home,not the the hotel recipes.God Bless. Thats so intresting! I have heared that the food is very tasty at gurudwaras. I am salivating to have some sweet. Yummy! Awesome post. Got to learn a few things about this tradition of yours. I have always felt that the prasad tastes divine when we recite the sacred hymns and do and you iterated it in your post. Prasad looks very divine Vaishali!! Interesting one vaishali I have seen these type of preparation in a documentation film about India but this is the first time came to know about kadah Prasad. I am also going to post a similar kind of dish but with different flour don't want to reveal now. This reminded me of my hometown and my dadi 🙂 What a lovely start to the BM Vaishali ji. Looking fwd to a lot more from you. I have read about the langar food. It looks so good that I have bookmarked your post and will try it later. Wow Vaishali what a beautiful description. I was honestly remembering the documentary of langar as I was reading this post. must visit my sister who lives in Nanded and she keeps telling abt langar there. Lovely insight into the tradition of Gurudwaras, Langar and the Prasad itself! Love the prasad. I totally agree that the dedication with which the prasad is prepared and served makes a lot of difference! And langar is really amazing..
Nice read Vaishali. I have never been to a gurudwara and just heard all this through a friend of mine. Now I know what it really looks like. You have written it so well.That prashad recipe is a must try. The texture is awesome! Nice writeup and thanks for sharing your tradition. Love your delicious prasads..
Lovely post Vaishali. Great to know about the traditions. Thanks for the authentic recipes.